It’s time for Big Announcement 2016!! 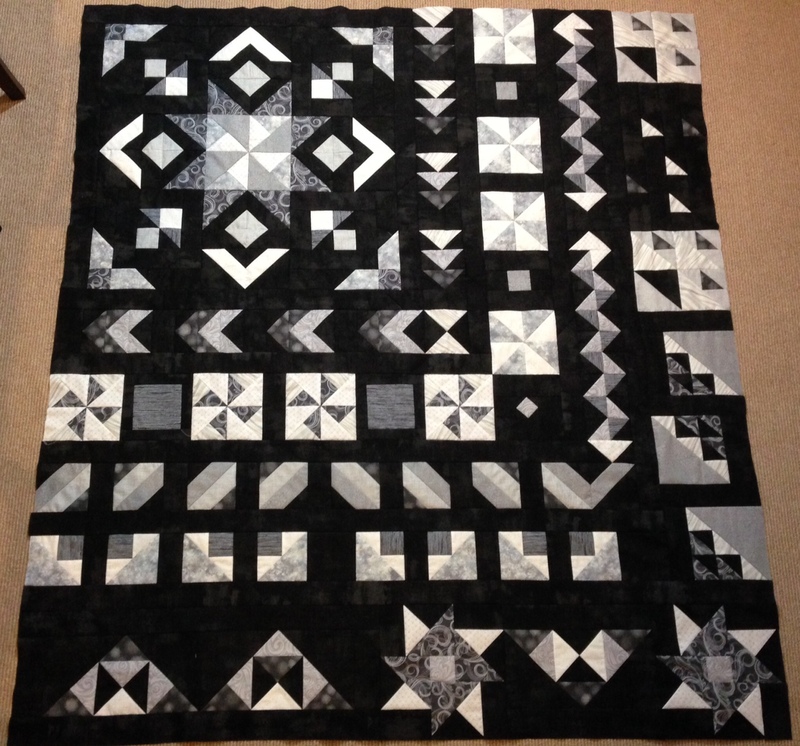 In conjunction with Swan Amity Studios, I will be doing a Block of the Month / Quilt Along for 2016. The BOM will be Star in the West which Swan and I originally ran as a BOM at our LQS. I did my version in greys, named 10 Shades of Grey. The BOM will start on January 2 and run for 12 months. Each month you will be emailed a pattern. 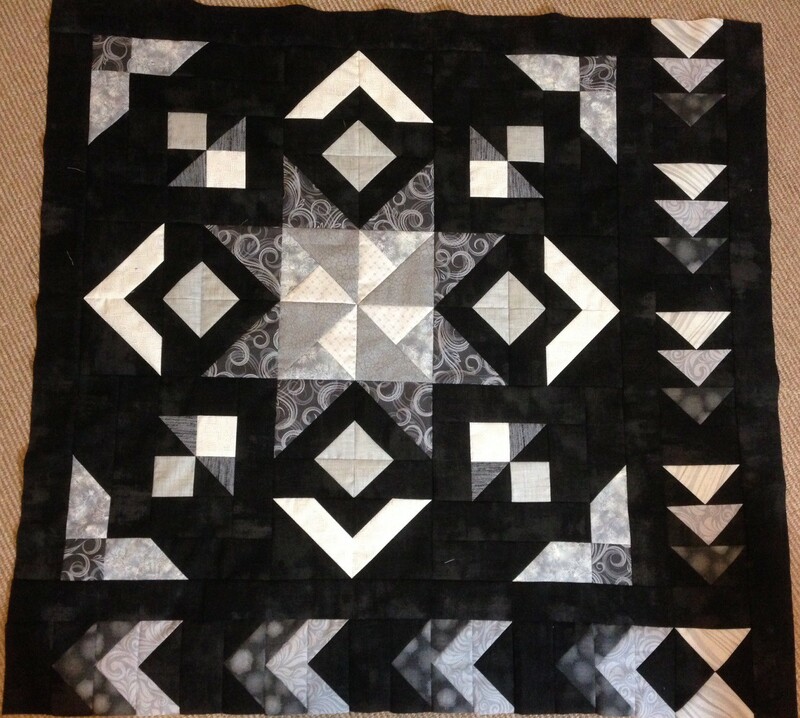 There will be a Flickr group to share images of your quilt top in progress. I will also be sharing some of them on my blog. The patterns for the entire series is only $24. You can signup at Swan’s website. And then check back here on January 2 when the first pattern comes out. When I was in Tucson last month, I brought 10 Shades of Grey home! Swan used her professional setup to take some photographs of it. This is the best one. Nancy did such an amazing job on the quilting. I was shocked with how intricate it was. She used white and grey threads. The negative space has so many individual shapes quilted into it. It really brings the quilt to life. And, just, wow. That’s really the only way I’ve been able to describe the quilt. We (Swan and I) will be doing this as a Block of the Month/Quilt Along through my site starting in January. So if you want to make your own, make sure to follow me here or on Facebook for more information. The quilt is home and on my bed. 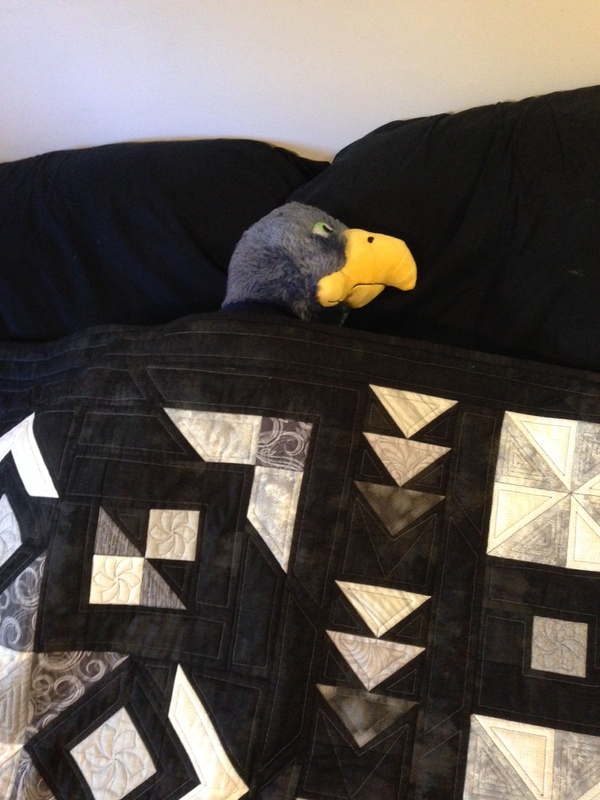 Here is Blitz (my Seahawks pillow pet) enjoying it. Here it is! 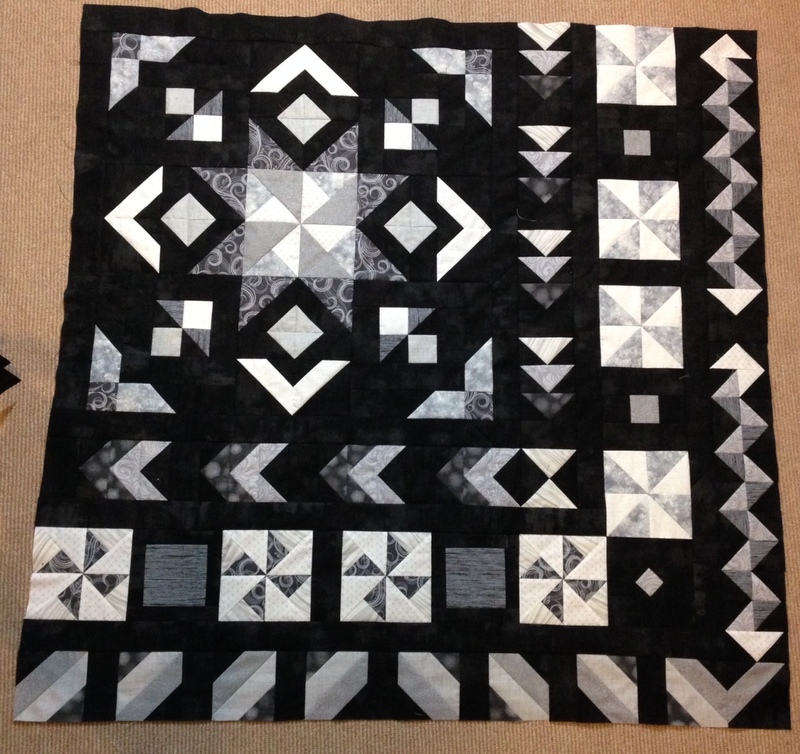 The finished top for 10 Shades! As the quilt went on, I was having trouble deciding which fabrics to use where, so for the last row (on the bottom), I just used all 10 fabrics. 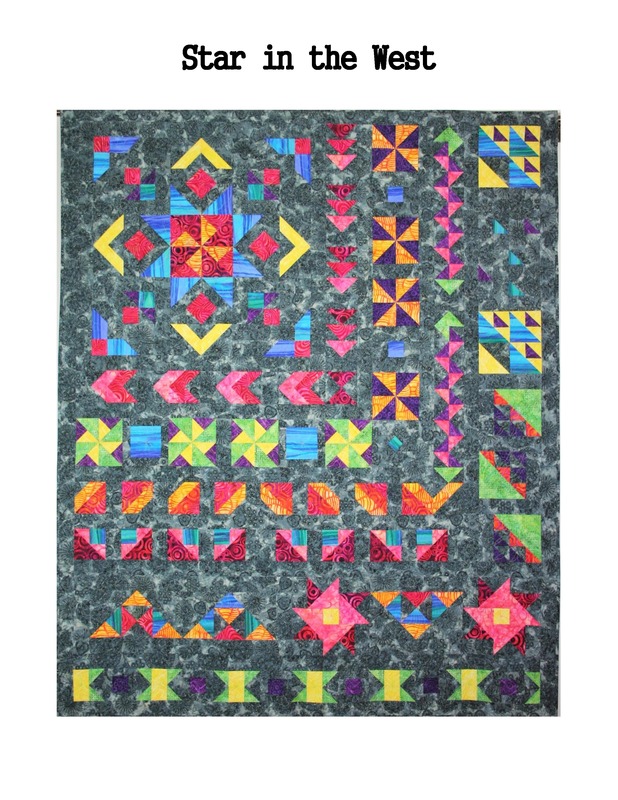 The quilt is on its way to Tucson to be quilted by a former quilt shop co-worker, Nancy Stein. Nancy did a lot of the shop samples and does amazing work. I asked her to use black, white, and/or grey thread but beyond that, she has free rein to do whatever she wants. She was saying she see a lot of lines, rather than curves. I am so excited to see what she comes up with! When it’s finished, Swan from Swan Amity (also in Tucson) is going to pick it up. Swan is going to bind it (I did a happy dance around the office) and then photograph it as an alternate color option for Star in the West (second happy dance). I’ll pick it up in June when I’m next visiting. We’re also talking about running this as an online Quilt-Along. We have a few other things to do before we can fully focus on the details, but it does look like something that will be happening, and soon. Tentatively, the plan is that I’d run the monthly portion through my site and host the Flickr/Instagram/something to show the blocks each month. And this means that I get to decide what fabrics to use for the next version! I’m thinking of returning to my usual bright jewel toned fabrics on a black background. Stay tuned for more details. Last night I buckled down and (possibly) finished 10 Shades! I added one more border on the right (Months 9 and 10) and bottom (M 11 and 12). 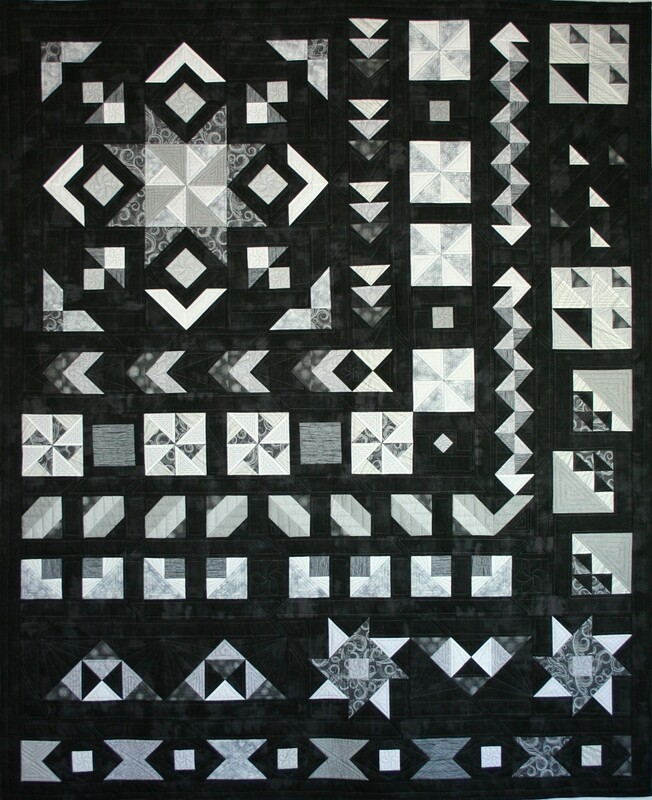 When Swan made the initial quilt and showed it to Joelee, the quilt shop owner, Joelee said that it was too square and Swan added an optional bottom border. You can see it at the bottom of the pattern available here. I’m still deciding if I want to add that or not… as of right now, I’m leaning towards yay. 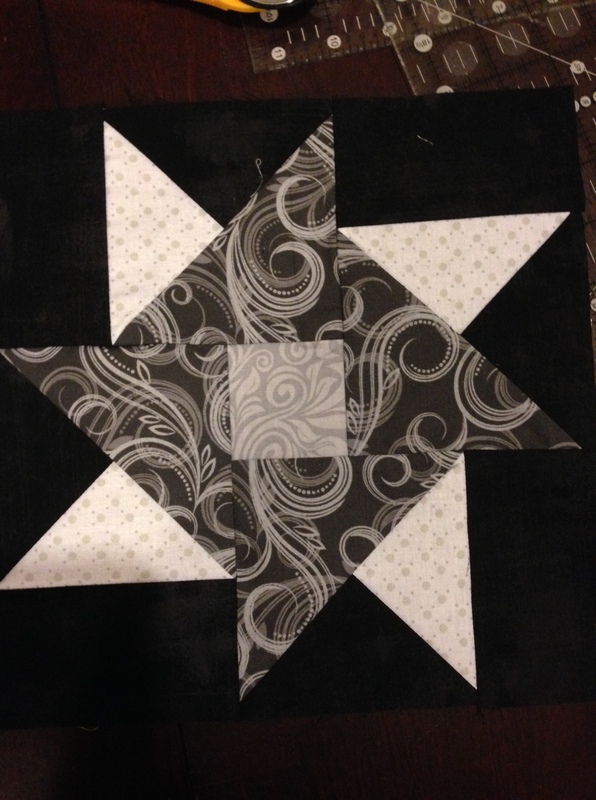 Here is a close up of one of the star blocks in the bottom. I nicknamed it “Ninja Star”. It was good practice in doing partial seams which I usually avoid. Our new BOM is all partial seaming to put the blocks together, so I can’t avoid partial seams much longer. I’ve made a bit of progress of 10 Shades. I added the month 8 border to the bottom. There is one more side border (months 9 and 10) and one more bottom (11 and 12). There also is an optional bottom border, but I want to get the rest of it together before I decide if I want to add that. I’m getting ready to start on the Star Gazing BOM so I’m trying to get this one closer to finished (or, gasp, actually finished) before switching projects. 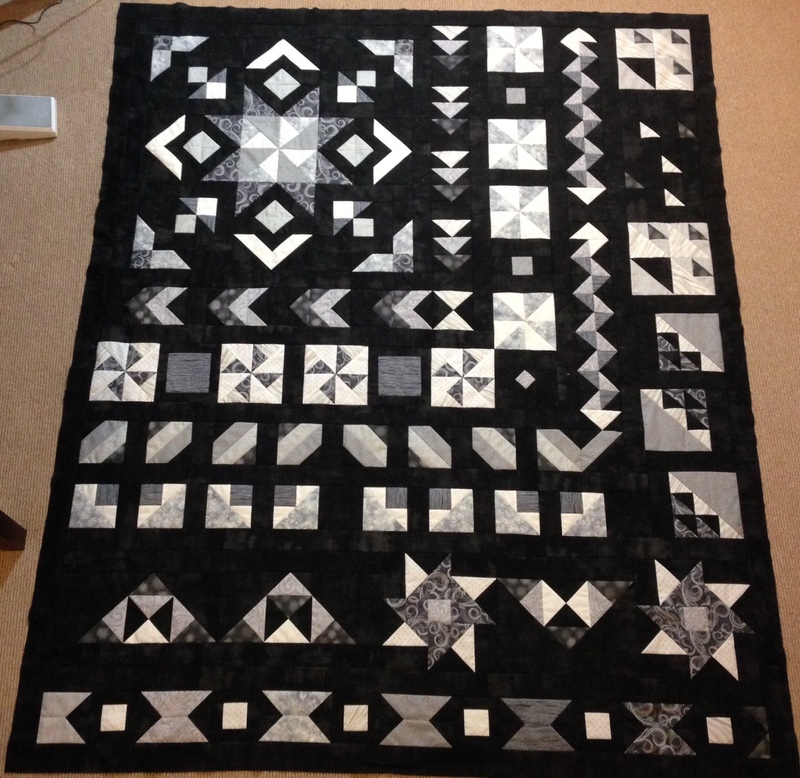 I spent yesterday evening working on 10 Shades and am now through Month 7. It seems like lately I’ve been doing a lot of designing (and shopping) and not much actual construction of anything. So last night was a construction night. I finished attaching the two pinwheel rows to the right and bottom. 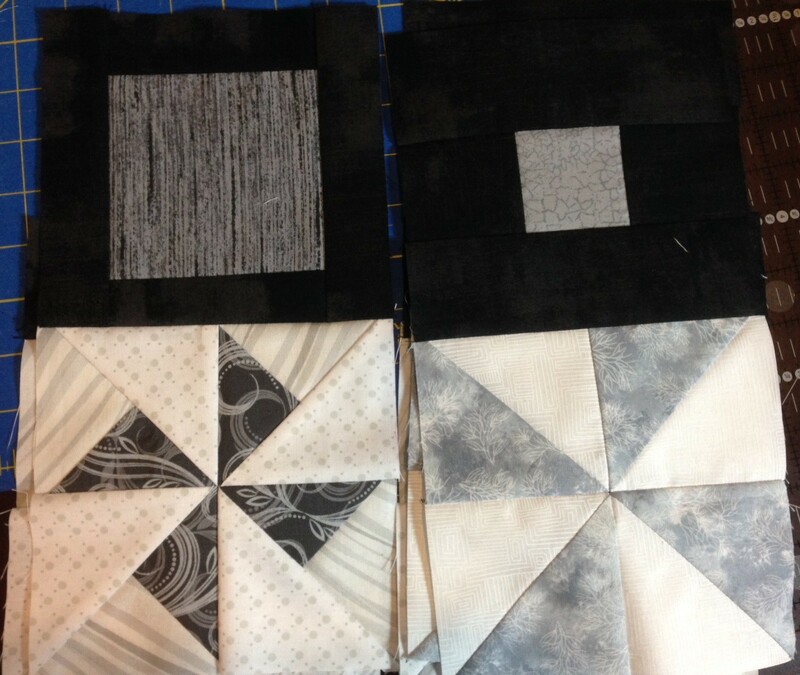 I then made a bunch of HSTs for the snakes on the right and made the bottom stripes. There are 5 months worth of blocks left. There’s also an optional bottom border. So I’m halfway finished! Not much of an exciting update today. 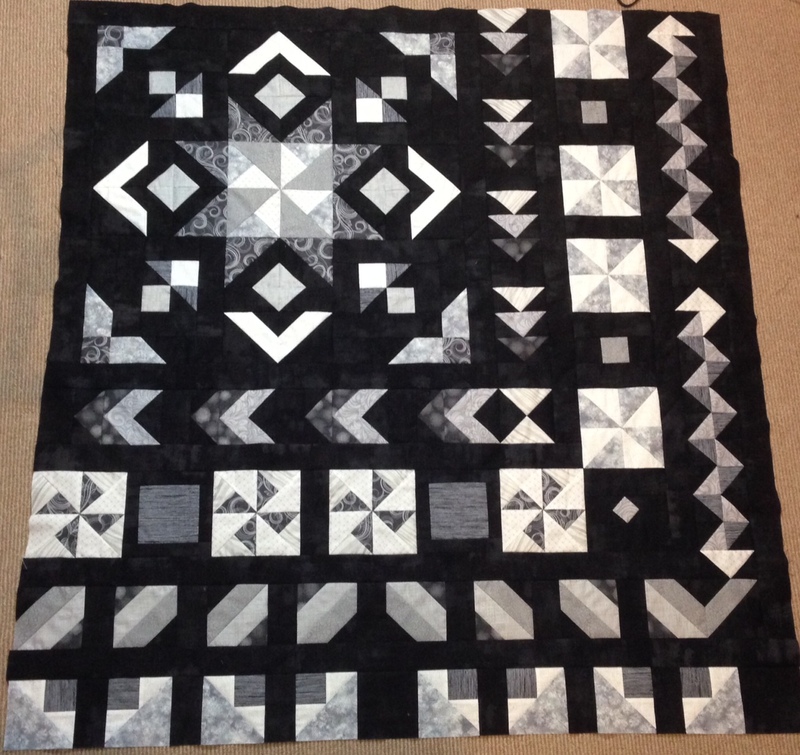 I’ve been working on 10 Shades and have added month 3 to the center (since it was originally designed as a BOM, each of the rows are months or parts of months). Month 3 is the right and bottom border of flying geese. I am starting to assemble the rows for months 4 and 5. Month 4 is on the right and 5 is on the left. I’m a little concerned it’s a bit too much white, but we’ll see. I should have those assembled and attached this weekend!